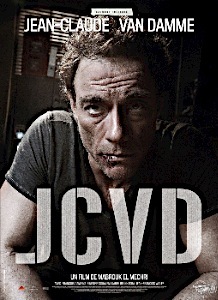 JCVD (2008, Director: Mabrouk El Mechri): At just 47 years-old, Jean-Claude Van Damme (JCVD) is looking really old and tired. He’s a fading action hero like Sylvester Stallone and Steven Seagal. What could be a better way to get back in the spotlight than make a film about yourself, warts and all? It worked for Pauly Shore, sort of. Van Damme plays himself in this action-comedy. He walks into a bank robbery and gets taken hostage with several others. The police mistakenly believe that Van Damme has gone over the edge and that he alone is behind the robbery and hostage-taking. This isn’t your typical Van Damme action film. Instead, it examines the nature of fame. It shows how false the notion of celebrity can be. The hostage crisis shows Jean-Claude to be a regular guy who fears for his life in a dangerous situation. He may be a famous Belgian movie star, but he’s also in the middle of a child custody battle, broke, and losing movie roles to that damn Steven Seagal. All of this leads up to a bizarre monologue whereby Van Damme looks directly at the camera and pours out his soul for 9 minutes. I’ve never seen anything like it, but the scene absolutely works. At the Q&A after the film, director Mabrouk El Mechri revealed that this entire scene was kept secret from the crew until the moment of shooting. This film generated a lot of buzz at Cannes which is sure to continue after the screenings in Toronto. Tonight’s crowd at the Ryerson Theatre loved the film and it was a great way to kick off the Midnight Madness program at TIFF ’08. I found the film to be unique and quite enjoyable despite the comparisons to Being John Malkovich (1999). If you’ve ever wondered what happened to the “Muscles from Brussels” then JCVD is your answer. This entry was posted in Film Festivals, TIFF and tagged #tiff08, belgium. Bookmark the permalink. Very curious about this one ever since I saw it in the lineup. Glad one of y’all saw it, and am even more curious now. Thanks for the review, Jay! PS: I miss Toronto. Gotta get back to the fest someday.